Fifteen years working in human resources at Microsoft was enough for Lara Hamilton. Hungry for change, “I knew I wanted to do something in food, but I wasn’t sure what,” recalls the owner of Book Larder, Seattle’s only dedicated cookbook store and culinary events-space, making its debut Wednesday, Oct. 12 in Fremont. The catalyst for change came, as is so often the case these days, via Twitter. At the suggestion of food-focused friends, Hamilton began to “follow” Kim Ricketts, owner of Kim Ricketts Book Events and the culinary matchmaker behind Cooks & Books — the food- and wine-fueled schmoozefests that bring together chefs, cookbook authors and the people who love them. “Kim tweeted that she wanted help bringing chefs to Microsoft,” looking for an on-campus contact interested in lending a hand, Hamilton said. Unaware that her virtual Twitter-pal was the name behind a popular speaker-series held on the Redmond campus, Hamilton answered the call. And that’s how the HR-specialist soon found herself rubbing elbows with (and hoisting books for) celebrated chefs like Thomas Keller and David Chang, an on-the-job opportunity that would become the start of a life-altering career change. Lara Hamilton, at Book Larder, open Wednesday at 4252 Fremont Ave. N.
Soon after, she quit her job. And when Ricketts offered her a new one in September 2010 — managing the Cooks & Books events — “I jumped at it,” said Hamilton. “I love cookbooks, I love working with people. It was all perfect.” Until her friend and mentor was diagnosed with multiple myeloma and primary amyloidosis. “In December, Kim sat me down and told me ‘I’m not going to survive this. I’m going to sell the company, and I want you to go ahead with the cookbook store'” — a shared dream the two had been contemplating. Ricketts died in April, leaving a hole in the heart of Seattle’s culinary community. But not before noticing a “for lease” sign on a former florist shop and pointing Hamilton in that direction — and selling her the Book Events company. 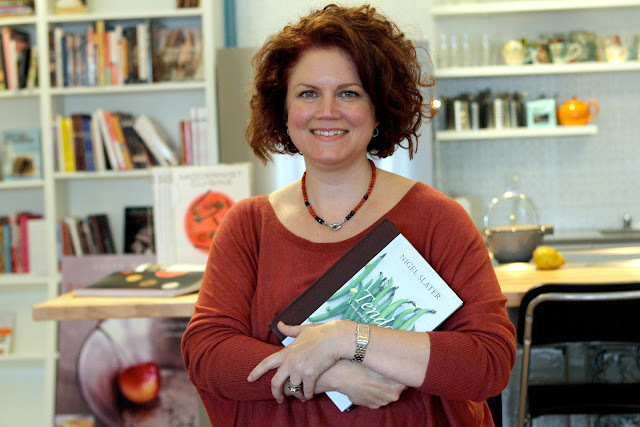 Billed as “a community cookbook store,” the Book Larder would have made Kim Ricketts proud. The shop is lodged in a charming storefront on a delicious strip that’s home to a neighborhood bistro (Hunger) and a brand new deli (Dot’s), down the street from a happening burger joint (Uneeda Burger) and across from a Neapolitan pizzeria (Via Tribunali) and one of Seattle’s best-known sandwich shops (Paseo). Hungry yet? Indeed, this larder’s tall white shelves are filled with recipes and culinary lore, yet Hamilton is determined to create a space that goes beyond the sale of books, extending a warm welcome to those of us who find community through food. That someone might be store manager Clodagh Reeves, a longtime cookbook collector and culinary school grad, who’ll be happy to set up an appointment to examine your collectible cookbooks, bought and sold here. You might also come here to learn about cookery first-hand in a small-class setting (Seattle chef and cooking instructor Becky Selengut kicks things off Oct. 13). Or attend a book-signing by a nationally known author (Adam Gopnik, Nov. 5) or a Seattle baker with a new cookbook (CakeSpy Jessie Oleson’s onboard Oct. 14). See the full schedule of upcoming events here. Continuing the business Ricketts bore and nurtured and adding a culinary bookshop to the pot, Hamilton insists, “If this experience has taught me anything, it’s that you can’t wait for stuff to happen” — you’ve got to make it happen. And that, she did. Book Larder is open Mondays-Saturdays 11 a.m.-6 p.m. and Sundays noon-4 p.m. through the holidays at 4252 Fremont Ave. N., Seattle, 206-397-4271; www.booklarder.com.